aAdapted from Office of Saline Water Special Report on Status of Desalting, November 1970.
bDoes not include 3000 vapor compression units on vessels sailing the oceans; each of these can produce several thousand gal per day. The U.S. Public Health Service Drinking Water Standards recommend a limit of 250 ppm for chloride and 500 ppm for total dissolved solids. When water is produced by desalination in areas governed by these standards, this level of salt and dissolved solids is specified as an upper limit. The International Standards for drinking water set the maximum allowable total dissolved solids limit at 1500 ppm. The location and construction of a desalting plant often involves transporting construction materials for great distances. It is most economical to build a plant on the edge of the sea, providing large amounts of energy to convert the salt water to fresh water and pump the fresh water inland. The cost of fuel is a critical factor in the choice of any distillation process, and the cost of electric power is equally important in electrodialysis processes. An inevitable by-product of a desalting plant is brine (concentrated salt water). When a plant is located at the edge of the sea, the brine is emptied into the ocean itself. The point of discharge must be chosen to minimize adverse effects upon the ecology through temperature elevation and salinity at the point of outfall. In some areas of the world, there is a market for the salt produced by additional evaporation of the brine. 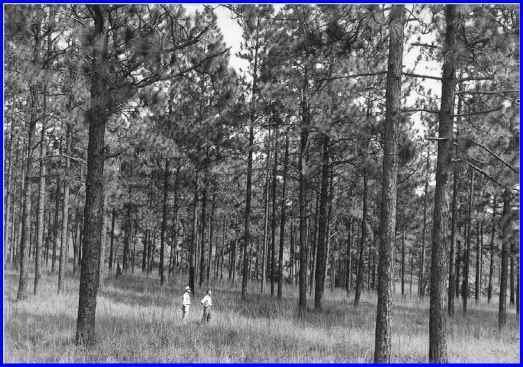 The requirements for fresh water determine both the type of plant and the choice of fuel. For example, on an ocean-going vessel the demand for fresh water may be only 20,000 gal/day. There are places in Australia where solar distillation is used to produce as little as 600 to 1200 gal/day. At the other end of the spectrum are the water needs of large cities, which exceed millions of gal/day. Optimization of energy utilization is one of the principal factors in the design of a desalting process. Energy—either thermal, mechanical, nuclear or electrical—is required. The cost of energy may represent as much as 50% of the total water production cost. The percent of recovery of fresh water from salt water, a basic design criterion, rests on considerations of energy utilization. Starting with seawa-ter having a concentration of 35,000 ppm of sodium chloride, the minimum isothermal work required at 70°F to separate 1000 gal of seawater is 2.6 kw-hr. However, this assumes removing water from an infinitely large volume of seawater, or pumping an infinite amount of raw sea-water through the plant with little recovery of fresh water. 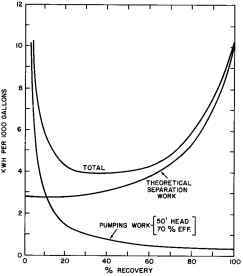 Theoretical work for separation increases with increasing recovery (recovery is the ratio of product to feed expressed as a percentage), while pumping cost decreases with increasing recovery. The total energy required as a function of percent recovery is expected to follow the curve (Gilliland 1955) shown in Figure 8.6.1. The optimum level of recovery for seawater is about 30-50% or about 2-3 volumes of feed to 1 volume of product water. For brackish water the optimum is about 3-8 volumes of feed to 1 volume of product. The higher percent recovery for brackish water feed is desirable because it is available in limited quantities compared to sea-water, and also because disposal of concentrated brine is usually a problem. FIG. 8.6.1 Work requirements for the separation of seawater as a function of recovery. Product per feed in percent. conservation of energy, separation of evolved vapors from brine, heat transfer, and prevention of fouling of the heating surfaces. Of these, conservation of energy is paramount. The cost of water would be prohibitive if steam was used on a once-through basis, as in a single-effect evaporator (Figure 8.6.2). 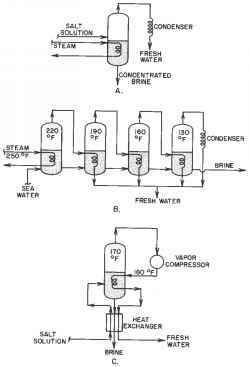 Figures 8.6.2 and 8.6.3 show evaporation systems that permit reuse of latent heat of vaporization of the prime steam supplied by the boiler. In multieffect evaporation (Figure 8.6.2), water evaporates at the highest pressure in the first effect. This vapor is condensed in the second effect to evaporate an approximately equal amount of vapor. Proceeding in this manner, the amount of steam and cooling water used per lb of fresh water produced is reduced. In vapor compression evaporation (Figure 8.6.2), the water vapor evolved is superheated. This vapor is compressed to a pressure or saturation temperature sufficient to provide the necessary heat transfer. 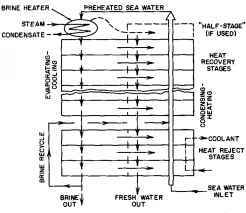 The condensed water vapor is the product water, and the residue brine is used to preheat the incoming salt water. In multistage flash evaporation (MSF) (Figure 8.6.3), the operating principle is described. Multiple-effect and MSF operations not only reduce the amount of steam required and the cost of the boiler, they also save cooling water; hence the capital cost of the condenser and cooling water supply system is also reduced. Vapor compression operation eliminates condenser cooling water and almost eliminates the need for a steam boiler. FIG. 8.6.3 Multistage flash evaporation. After being heated to the highest temperature in the brine heater at the top of the diagram, the seawater passes while flash evaporating and cooling at successively lower pressures (vertical arrows down on left side). The vapors leaving each flash evaporation (horizontal arrows) pass to preheat the seawater in the condensing-heating tubes (wide vertical arrow on right side). Freshwater condensate also passes from higher to lower stages for evaporation and cooling, to discharge at the bottom. Vapors may also be withdrawn from the brine heater to be condensed in the half-stage (lines upper right) to increase production of fresh water.